Packed with 14 key nutrients. Just add milk. Free from artificial flavours, colours, sweeteners and preservatives. Suitable for vegetarians.Delicious goodness packed with vitamins and minerals plus fibre. Source of vitamins A and C which helps support a healthy immune system. Rich in calcium and vitamin D for the maintenance of healthy teeth and bones. Rich in vitamin B5 which helps maintain normal mental performance. 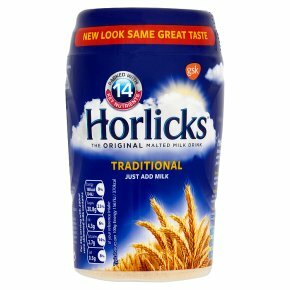 To make delicious Horlicks, simply spoon 3 - 4 teaspoons (25g) of Horlicks into your mug and mix to a smooth paste with a little water, pour on 200ml of hot Water, stir well and enjoy. To microwave, simply follow the directions above with cold milk, microwave for 1 minute (800W). Stir well, heat for a further 30 seconds, stir again and enjoy. Not suitable for babies under 1 year.